Despite the hype over the adoption of on-line shopping, a recent study shows that consumers still favor traditional supermarkets and grocery stores for their needs. David Fikes of the Hartman Group speaking on a U.S. Grocery Shopper Trends webinar organized by the Food Marketing Institute, presented current data on supermarkets. The number of shopping trips and spending remained steady in 2018 with an average ticket of $109 per week. Most households make 2.2 visits to a supermarket or food store each week. Despite an increase in consumers using online purchasing, from 16 percent in 2015 to 28 percent in 2018, supermarkets are the “key grocery destination among all channels hovering around 50 percent for the past few years” according to Fikes. He attributes stability to adaptation by supermarkets. The line between on-line and brick-and-mortar is becoming blurred with each channel impinging on its competition. This is characterized by the purchase of Whole Foods Market by Amazon and by the move to on-line shopping by Walmart, Target and Kroger. Consumers tend to purchase center-store and shelf-stable items on-line. 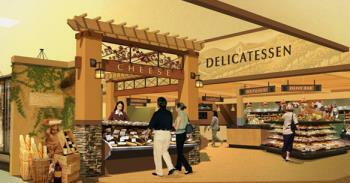 Their preference for supermarkets is clear with respect to deli, fresh and frozen food items including produce and meat. Introduction of prepared foods, including pizza and meals and more extensive ethnic and cheese offerings including sit-down areas have converted some supermarket chains from simply a shelf to checkout process to a destination. There is obviously an opening for eggs in the paradigm. It would be necessary to extend beyond egg salad in PET containers or self-service bars to actual omelet stations combined with other snack foods presented for impulse purchase or between-meal snacking. This concept would apply the principle that if innovative products are attractively displayed customers will buy them.